At Laurier, it’s not uncommon to see a service dog in training on campus or even see people in your building about to take their dog on a walk. It seems like Laurier has an infatuation with the four-legged friends that is unlike any other. Dog therapy has become increasingly popular within academic institutions, but the question is whether these dogs are actually of use to help people or are just an excuse to play with animals on campus. 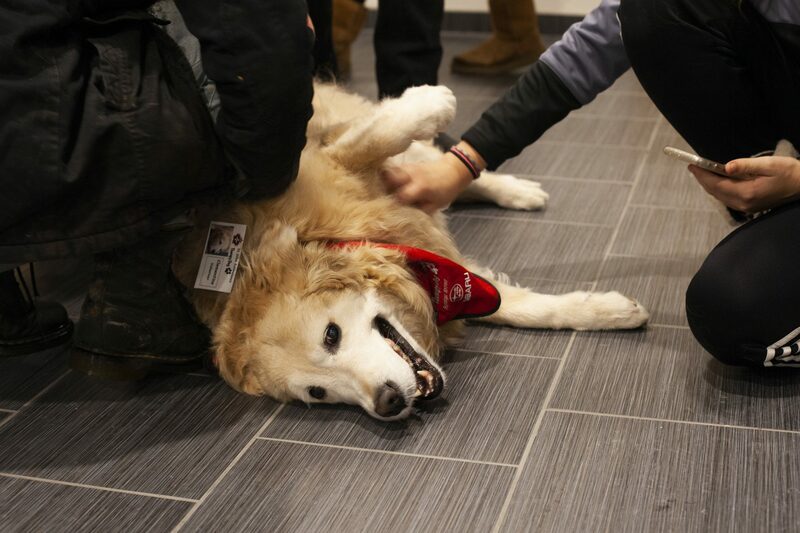 On Friday, Nov. 16, the Career Centre held a “Destress with Dogs” event during their usual 1 p.m. to 4 p.m. drop-in hours, giving students an opportunity to play with the animals as well as ask questions at the Career Centre. Deborah Elliot, one of the volunteers with St. John’s Ambulance Therapy Dogs, worked with her own dog Clementine for the event and brings her to many different places such as retirement homes and community living events. “They’re tested for demeanour, they go through 10 visits that are supervised to make sure they’ll fit into the program the way [St. John’s] hopes they will, and then they go. Clementine has been visiting in a nursing home since June,” Elliot said. The description of the event was catered towards bringing people to the Career Centre for resume help and to look at their other services, but the dogs stole the show as four volunteers and their dogs were surrounded by students lovingly petting the animals. “I knew of the program, and I knew Clementine’s temperament and behaviour, I knew she would fit right in. She loves the attention, and she’s calm, she has all the characteristics they were looking for, she just happens to be a rescue also,” Elliot said. “It’s been on my retirement bucket list to get her doing this; she started in June and did her 10 visits. Now that she’s finished that, when these events become available, we can sign up to attend them and so she has been going to a lot of campus things. She has been to UW a number of times, and she’s at Conestoga next week,” Elliot said. Though getting dogs on campus may seem like a ploy to get students out to events since most students love hanging with the pets, the dogs that are brought out must go through training to be certified in order to attend events with students, elders and others, and aren’t just any old dog brought from home. “She goes to a retirement home once a week on Tuesday afternoons, so that’s her regular schedule. We pick up these other events when they’re available. She gets a lot out of it, and the students love her. The retirement homes get great pleasure, she has people waiting for her on Tuesday afternoons,” Elliot said. Students get a de-stressing factor out of the visits with the dogs, but for other communities, they may get comfort or safety out of them. As many older participants may suffer from diseases like Alzheimer’s where things become unfamiliar and scary as their memory fades.The dogs help these communities feel safe.